When Therapeutic Associates opened its doors in Sisters a quarter-century ago, Sisters was a smaller, quieter place. The practice was located in a house on Adams Avenue that now is home to a daycare facility. "When I came there in 1996 it was just Suzy (Ramsey, physical therapy assistant) and Gary (Keown)," office manager Kristin Sorensen-Hilgart recalls. "They didn't have anybody here all the time. We didn't have that many patients." 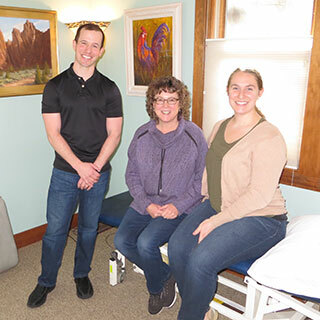 Founded in Central Oregon by Don Wick in 1993, Therapeutic Associates now has six clinics in the region - and the Sisters clinic located adjacent to Sisters Athletic Club (SAC) on the FivePine Campus is plenty busy, day in and day out. Therapeutic Associates' relationship with SAC began in 2004, when the athletic club was located where Blazin Saddles is now. The ongoing relationship allows Therapeutic Associates patients to "step down" to semi-independent and independent rehab work at the club, often using the pool. According to Matt Kirchoff, who directs the Sisters clinic, SAC's "wellness model" makes a good fit. It tracks with the evolution in physical therapy in general that Kirchoff has seen over the 11 years he has been a physical therapist. The practice has moved from "more passive modalities" such as massage and electro-stimulation to more active measures and teaching techniques and practices a patient can maintain on their own. Kirchoff says that the goal nowadays is "to foster independence rather than dependence of the physical therapist." He notes with a smile that "I'd rather see them on the opposite side of the club than on our side." The fact that Oregon allows direct access of patients to physical therapists has changed the field, Kirchoff notes. "We have many more self-referred patients," he said. Patients in 2019 are more proactive than ever about their healthcare, and recognize that physical therapy is a good investment in prevention and/or early treatment. And patients' interests in physical therapy have evolved, too. While PTs still work with patients to overcome injuries, more and more patients are interested in avoiding injury in the first place - and enhancing their performance in their activities. PTs are spending more time assessing people and providing guidance. Sisters is "an aging, active population," Kirchoff says. The demand is high enough to keep three physical therapy clinics busy, helping people in Sisters live healthier lives while keeping them engaged in their favorite outdoor activities as they get older. That continues to be the mission of Therapeutic Associates as they move into their second quarter-century in Sisters. As for its longest-serving employee, Sorensen-Hilgart continues to love working at Therapeutic Associates. "I'm a real people/social person," she said. "I really interact with the patients a lot, get to know them. I've had two great bosses. If I didn't like them, I probably wouldn't have stayed here. I plan to stay till I retire." Therapeutic Associates is located at 1011 E. Desperado Trail #201. For more information call 541-549-3574.